Bloggers and SEO enthusiasts will tell you it’s essential to include an image on each blog post to spice up the post and boost your chances of showing up in Google search engine results. Images also grab the reader’s attention, so their eyes will more likely drift down to the image, which creates interest in reading on. Most small business blogs aren’t able to hire a photographer or purchase stock photography for each and every article added to their website. While it may be tempting to turn to Google Search and snag an image, stealing someone else’s work is unethical, and according to US copyright law, image infringement can cost you up to $30,000 per use. But there’s no need to go to jail for using that picture of a girl laughing alone with a salad! Here’s a list (and it is by no means exhaustive) of some online resources for finding free-to-use stock photography to use for your blog. This site requires you to register first (for free) in order to download any images. Once you’ve created your account, make sure you navigate to https://www.123rf.com/freeimages.php to search images that are free to use. Images ‘expire’ after a certain timeframe, so a search you did a month ago for ‘icy roads’ may turn up completely different results today. All free use images are available to download, so you can spend an hour or so collecting images for a 'library' of images that would work for your blog, which may save you time in the future. A lot of the images have a 'stock photography' look and feel, so if that's what you're looking for, 123RF is the ticket. Imgembed is a relatively new option that’s been getting a lot of praise lately. It's known for high image quality and ease-of-use, both of which I found to be true. The process for getting an image here is a bit different from the previous exmable. After you sign-up for a free account and find an image, the photographer gives options for either premium or free use. For exactly $1.00, you can get an embed code that allows for up to 1,000 impressions with no attribution or watermark. This is a pretty attractive offer. However, I went with the free use option, and the site prompted me to enter the domain where the image would go and some fall back keywords. 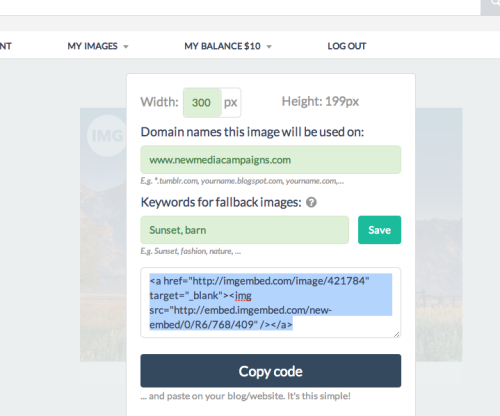 Then, it generated an embed code which I used for the lovely barn image you saw at the beginning of the post. For the purposes of this post, I'm not worried about the attribution or the watermark. The image quality on this site can be hit-or-miss, but if you're coming up empty with other options, this is always worth checking out. Everything is user submitted, so while there are some amateurish shots on this site, there are also some really nice images. This site also requires you to register in order to download an image. Although it's definitely not OK to run a google image search and grab the first cute puppy picture you find, Advanced Google Image Search can be a very useful resource, if used properly. Once you run a search, go to Advanced Search options and filter to only images that can be reused. This gives you some depth as it literally scours the web. Adding an image to your blog post is pretty easy - just follow some basic rules for adding visual content to your post, such as positioning it close to the top for the most impact, and making sure there’s some relevance to your article. Finding an image can be just as easy - and free! All it takes is finding a reliable site with free stock images, like the ones listed above, or try your hand and coming up with something on your own. Do you have another recommendation for a great place to find free stock photography? We'd love to hear about it in the comments!